Learn more about the Louisiana Explosive Regulations mandated by the Louisiana State Police Explosive Control Unit. 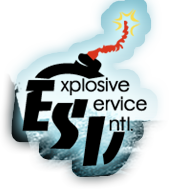 ESI provides explosive training to both law enforcement and private industry explosive contractors throughout the US and abroad. We offer several scheduled courses each year and are available to arrange specialty courses upon request and availability. Our courses and instructors have been certified by the Louisiana State Police. All course fees MUST be paid in full prior to attendance. Check or money orders are accepted forms of payment. Special payment arrangements can be made but must be done in advance. ©2019 Explosive Service, Intl. All rights reserved.